In Panama, on January 19 this year, supermarkets, pharmacies, and retailers were given 18 months to stop using plastic bags, and warehouses and wholesalers got 24 months. The new laws are leading to the development of biodegradable plastic bags. The laws create the incentives to do what should've been done years ago. I wonder how Richard knows the greenhouse gas effect on the climate is zero? You are certainly entitled to your opinion but I choose not to ignore the data based conclusions of the vast majority of the best scientific minds on the subject from around the globe rather than to resort to grossly unsubstantiated accusations of “money making schemes” and analyses by unqualified analysts. This subject, like religion and politics, rarely leads to a significant change of position by either side so let’s not waste any more of your valuable time nor mine and just agree that we disagree. Have a great day! Well it's just my opinion and it is seconded by many scientist who are beginning to rethink their positions. The climate has been changing for millions of years why would we even think it would stop changing at this time. The smart thing to do is to prepare for the inevitable. People who do will survive those that don't will suffer greatly. Attempting to control carbon emissions is a money making scheme promoted by those who will benefit. Countries like China and India who pump the most emissions in the atmosphere will never be controlled. In the meanwhile the U.S. would cripple its industries into bankruptcy trying to control it. Let's face it that's the real goal. 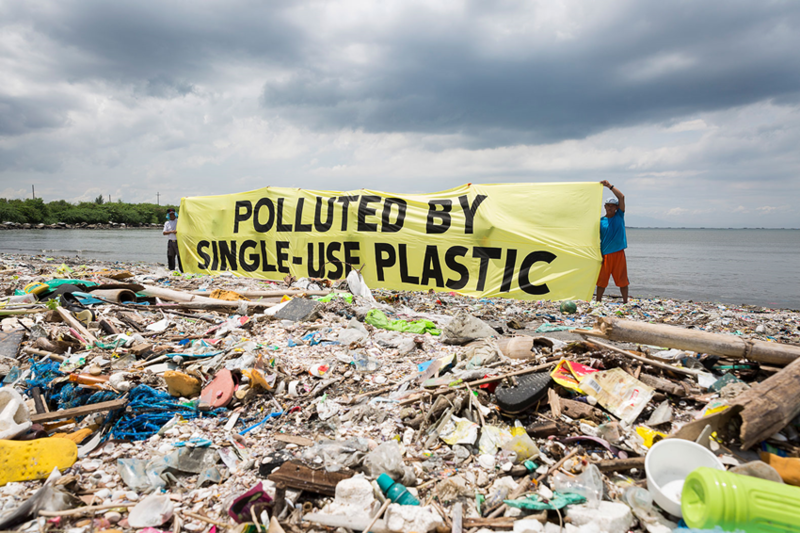 Ironic that the activists stand atop the plastic waving a sign made of...plastic. They probably buy into the climate hoax too. Agree with you completely on your comment re single use plastic. Disagree with you completely on your characterization of global warming as an uncontrollable “natural” occurrence. Happy to see them tackling what I see to be a far more destructive environmental issue than the inevitable change in temperature. At least the pile up and pollution characteristics of plastic can be altered by both manufacturing process and human consumption, whereas temperature change being simply a product of nature, is impossible to control.